November - Bray School Project N.S. A fantastic €634 was raised at the Bake Sale. Many thanks to all who baked delicious treats for our sale. Well done to the parents and children from 6th class who organised the sale. The PTA are organising a cake sale in the school on Wednesday 22nd November. The bake sale has always been a huge success and we're hoping to make this one just as successful. Please bake together at home and send in muffins, iced buns, cookies, flap-jacks, rice-crispie buns, sponge cakes, apple tart squares, savoury scones or anything yummy you’d like for the children to sell/buy. Each child should bring cash in small change in order to make his/her purchase. Muffins/cake slices/buns etc are generally 50c each. Please remember, due to serious allergies in the school all NUTS AND LUPINS should be avoided in your baking. 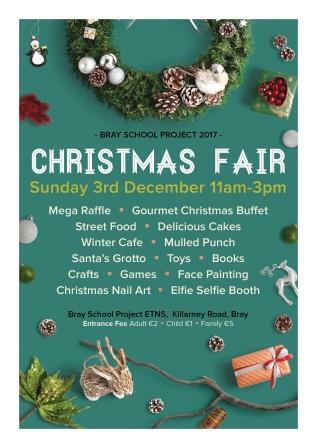 ​Not long to go now until our famous Christmas Fair. We are busy getting ready for our biggest fundraiser of the year but we desperately need your help to make it a success. An email was sent to the school community outlining the various ways you can help out with setting up, on the day itself and with the tidy up. Please visit the Christmas Fair page of our website for all the details. Click on the button to volunteer. The Christmas Fair has always been a successful event and with your help and support this will continue.